Stretching over 120 kilometres along the southern coast of Queensland, Fraser Island is the largest sand island in the world, it is a place of exceptional beauty, with its long uninterrupted white beaches flanked by strikingly coloured sand cliffs, its majestic tall rainforests and numerous freshwater lakes of crystal clear waters. A variety of tours are available from a quick day tour to extended tours that offer both motel and camping accommodation options. Tours depart from Brisbane, Noosa & Hervey Bay. Blue Dolphin Marine Tours offers this fantastic Whale Watch Cruise which is the perfect way to view whales in the ocean. This tour operates from July to October each year and is a perfect way for family and friends to spend time together and view these majestic creatures. Morning tea, lunch and afternoon tea are all included in the tour. Relax and enjoy the beautiful sunset while you cruise around the waters between Hervey Bay and Fraser Island on Blue Dolphin Marine Tours` luxury yacht. Sip champagne as the sun sets over the waters of the Great Sandy Strait and take in the beautiful panoramic views. This cruise lasts for 90 minutes and there is no better way to relax and wind down after a long day exploring the Fraser Coast region. The Fraser Island Eco Sailing Adventure is on the lovely waters of the Great Sandy Straits between Hervey Bay and Fraser Island. Here you look for the bottlenose dolphins and the Indo-Pacific humpback dolphins, which is a lesser known species. 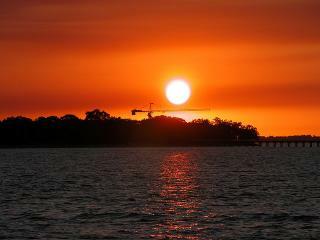 Both of these species reside in small residential pods of up to 20 and are found around Hervey Bay and Fraser Island. The waters are also home to dugongs, turtles, seabirds and other marine life. The cruise lasts for around 4 hours and morning tea is provided. The Remote Fraser Island Tour operates November - April and takes you to the pristine and untouched areas of Fraser Island. 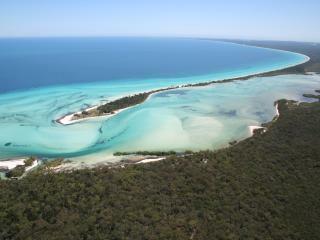 This Fraser Island tour offers small groups to ensure for a relaxing and memorable day. The tour visits Wathumba, Awinya & Bawarrady creeks and offers great activities such as bush walking, snorkelling and kayaking. 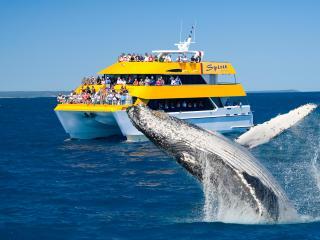 Come on board the "Spirit of Hervey Bay" for your chance to come eye-ball to eye-ball with a 40 tonne Humpback whale! The "Spirit of Hervey Bay" is the only whale watching vessel in the world that offers you the chance to view the Humpback whale closer than you ever thought possible. 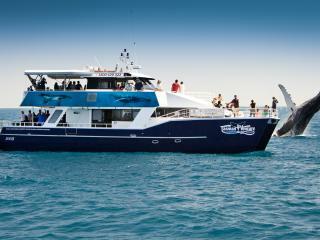 Experience the trip of a lifetime aboard the fast and luxurious whale watching vessel, The Tasman Venture. 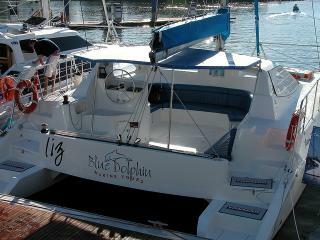 The 3 level boat has 5 clear viewing decks that allow for 360 degree views for your ultimate viewing pleasure. Highlights include underwater viewing room, viewing platform and hydrophone. 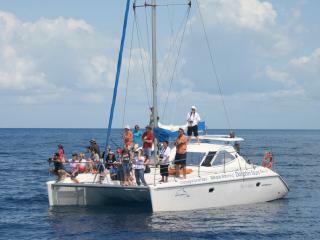 The Lady Elliot Island Day Tour is the only one of its type in Australia. The visit allows you to view one of the most pristine sections of Australia's Great Barrier Reef from the air as well as from above and below the water all in one day. Take to the air for a scenic coastal flight to Lady Elliot Island, a true coral cay on the southern Great Barrier Reef, overflying Fraser Island. Spend 6-7 hours snorkelling, swimming or enjoying an informative reef walk.